Be the first to share your favorite memory, photo or story of Lacy . This memorial page is dedicated for family, friends and future generations to celebrate the life of their loved one. Lacy Eugene Puckett, age 93 of Pikeville, Kentucky passed away Sunday, September 2, 2018 at the Pikeville Medical Center. 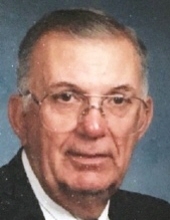 He was a Life Insurance Agent and served as Manager for Commonwealth Life Insurance. He served on the Board of Directors of First National Bank and also Pikeville Medical Center. He was a member and Elder of the New Beginnings Fellowship Church of Pikeville. He served in the 41st Infantry Division of the United States Army where received 3 Bronze Service Stars, the Silver Arrowhead and was awarded the Purple Heart. Lacy was born in Paintsville, Kentucky on December 13, 1924 the son of the late Lacy Eugene and Sola Boyd Puckett. He is survived by his wife, Anna Belle Lyons Puckett, two sons, Gary E. Puckett (Debbie) of Pikeville, Ky. and Michael Puckett (Dorsie) of Richmond, Ky. and one daughter, Dianna Jean Harmon of Winchester, Ky. He is also survived his sister, Emogene Burton Chandler of Paintsville, Ky. and seven grandchildren, Melissa Adkins, Amy Harmon, Solina Cole, Jeremy Puckett, Tyler Puckett, Jordan Puckett and Bryce Puckett and twelve great-grandchildren, also a host of great-nieces and great-nephews, including Dawn Stewart and Madison Stewart. And a special appreciation to Lacy’s caregivers Teresa Hopkins, Rella Jarrell and Shana Adkins. To send flowers or a remembrance gift to the family of Lacy Eugene Puckett, please visit our Tribute Store. "Email Address" would like to share the life celebration of Lacy Eugene Puckett. Click on the "link" to go to share a favorite memory or leave a condolence message for the family.